Launched in 2016, Startup India intends to build a solid ecosystem for nurturing innovation and startups in the country to drive sustainable economic growth and generate large-scale employment opportunities. As per the ASSOCHAM India 2017 report, approximately 50 per cent of total incubators are set up in non-metro cities, outside NCR, Bengaluru, Mumbai, and provide vast opportunities for the non-metro entrepreneurs. 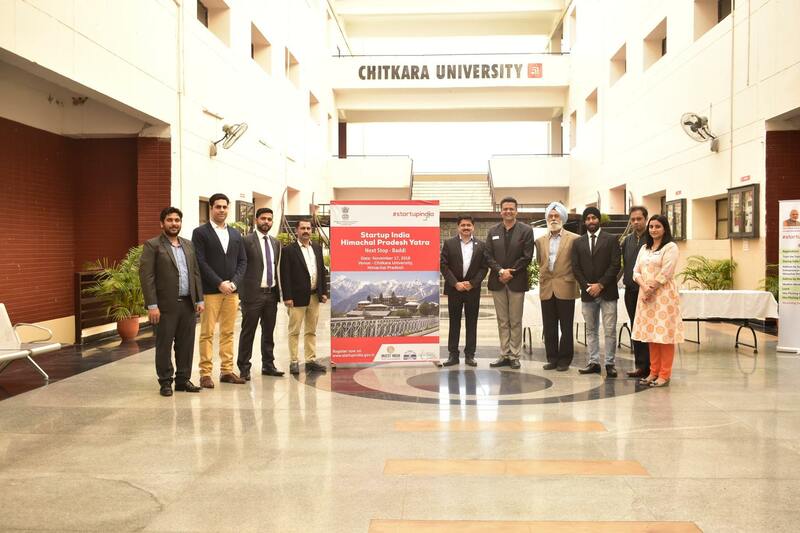 The Government of Himachal Pradesh in collaboration with Chitkara University – Himachal Pradesh, conducted a one-day Bootcamp and workshop on “Startup India” where successful mentors and students came forward and shared their inspirational stories and entrepreneurship knowledge. The Startup India Yatra aims to provide a platform to handhold budding entrepreneurs so that they realize their startup dream, get incubated at a facility and take their idea to the next stage. The event at Chitkara University – Himachal Pradesh, was graced by the Deputy Director Industries – Govt. of Himachal Pradesh, Mr. Sanjay Kanwar, and his associate Mr. Maneet Kumar. They delivered motivational talks, gave presentations on ‘Startup India’ and spoke about its benefits, to the young startup ecosystem of India. Joined by our esteemed guests were Vice Chancellor Dr. Varinder Kanwar; Director CEED Mr. Sumeer Walia; and Manager Startup India Mr. Akarshan Sethi with his team. A total of 273 students registered from all over the state of Himachal Pradesh, where 26 Startup Ideas were pitched, out of which 16 were shortlisted for the grand finale. The Bootcamp aims to promote job creation in tier 2 and tier 3 cities and towns and offer aspiring entrepreneurs lessons on business planning and how to startup. The Bootcamp also features presentations on Startup India and includes intensive ideation workshops. This is followed by a pitch fest where the participants can submit their startup ideas, and shortlisted ideas get a chance to be incubated in the state-run incubators.